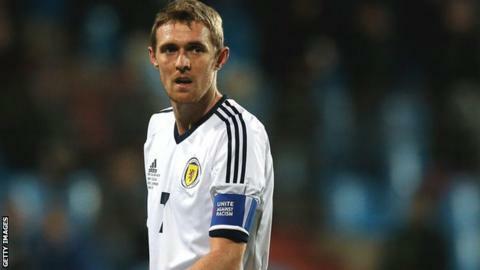 Manager Gordon Strachan is eager to welcome captain Darren Fletcher back into his Scotland squad as he recovers from a chronic bowel disease. "The quicker he gets back, the better for Manchester United and for me," Strachan told BBC Radio Manchester. "Any problems on the pitch never affect Darren and he'll deal with the problems he's got just now in the same way." And Strachan, who was without Fletcher for his first game in charge of the national side earlier this month, believes Fletcher still has a big role to play for both club and country. "If you look back at Manchester United over the last six or seven years - any time there's been a big game, Darren's played in it," he said. "As a manager, you pick a side you can trust." Fletcher, who won the last of his 61 caps for Scotland in November 2012, was after it was revealed he was suffering from ulcerative colitis. He made his comeback in September and played 13 times before United announced he required further treatment and would be out for the rest of the 2012-13 campaign. In Fletcher's absence, Celtic's Scott Brown captained Scotland in their on 6 February. The 56-year-old, who played under Ferguson at Aberdeen and also during a five-year spell at Old Trafford, said: "You just need to look at their results - they're a juggernaut just now. "Whether you think they're playing the most stylish football that's ever been seen, you don't know, but in terms of winning, it's as good as you've seen. "If you were picking a team of 11 from the two squads, I think a lot of that 1999 side would be in it, but with the game they're playing, you probably need a bigger squad. "It's great that players can have a day off or an injury, knowing that the players coming in can deal with it."